San Antonio has a number of notable trade shows exhibitions each year and excellent facilities to host them. Attending a trade show is a great idea for any business that’s looking to thrive in their industry. The right event can help you connect with potential partners, increase brand awareness, provide an opportunity to carry out market research, and generate a huge volume of sales. However, to make the most of the visit to the trade show, your booth must be exceptional. Keep in mind that you’ll be competing with the industry leaders at the event for attention. Evo Exhibits can help you create a trade show booth that oozes professionalism and sends the right message to your target market. For nearly 40 years, the Home & Garden Show in San Antonio has attracted huge crowds interested in upgrading their properties. The event includes a number of categories such as kitchenware, landscape materials, plants, entertainment systems, spas, pools, decks, and much more. The constant flow of highly targeted leads with buying power means you could walk away from the exhibition with impressive sales numbers. A number of guest celebrities have attended the show in the past to draw in large crowds, including Brian Santos and world-renowned sand sculptor Ted Siebert. Investing in this event can transform your presence in the marketplace, but be sure to go in with a plan. Need help brainstorming? Contact an Evo account executive today! For vendors in the food industry, this exhibition is the place to be in San Antonio. The event will bring together chefs, managers, crockery educators, caterers, franchisees, restaurateurs, and consultants. Debut your market strategy at the event and you can generate a lot of business for your company. The exhibition will be held at the Henry B. Gonzalez Convention Center, which is an excellent facility that can accommodate a ton of foot traffic. In addition to attracting attendees, you can also interact with other industry leaders to gauge the current state of the market as well as anticipate upcoming trends and tech. This event offers a fantastic opportunity to connect with other industry professionals and will potentially open new doors for your business. In Texas, restaurant sales are up to $52.4 billion annually and the Texas Restaurant Association Marketplace can help you get a share of that large pie. It’s a great chance for new businesses to make a name for themselves. Hosted by the San Antonio Manufacturers Association, this event at the Freeman Coliseum Exposition Hall offers free admission for attendees and over 150 manufacturing vendors. Whether you’re looking to drum up new business, get your questions answered, or connect with local suppliers to cut operational costs, this event is a great opportunity to grow your brand. Are you overwhelmed by the amount of work it takes to create a successful trade show booth? Let Evo Exhibits help! We know getting the small details right can make all the difference and our team is well-prepared to perfect your trade show experience. Contact us today! The biggest trade shows in San Antonio provide excellent opportunities for businesses to elevate their level of success. 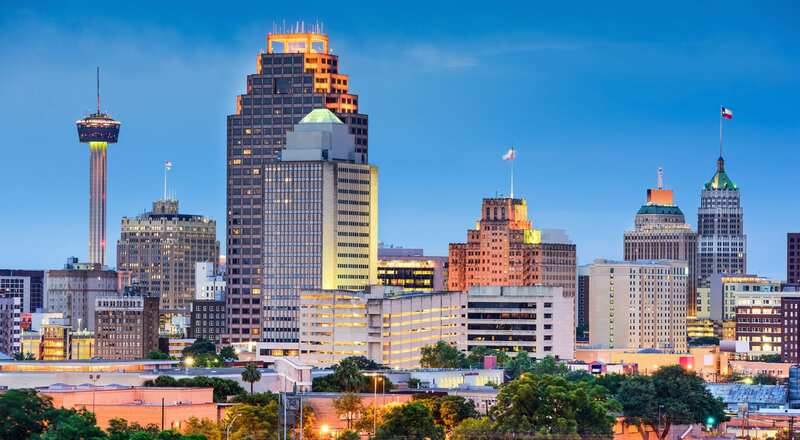 However, San Antonio is home to plenty of other trade shows that may also be a great fit for your business. Be sure to shop around! Exhibiting at a trade show is appealing because of the highly targeted footfall, which for the most part, is an audience looking to buy. Taking advantage of this concentration of hungry buyers can help meet your yearly sales numbers and significantly increase the size of your loyal customer base. Consider attending an exhibition in San Antonio this year and it may help unlock new doors for your business.